A highly distinctive group of garnets and sapphires, all of identical shape, probably derive from a single workshop, perhaps in Constantinople. A number of these gems mounted in fine gold rings have been discovered in hoards of jewellery and gold coins, which can be firmly dated to the end of the 5th century AD. The most popular images on the garnets are doves, although peacocks, eagles, and dolphins also appear. Other examples are engraved with a new variety of Christian symbols and images, including representations of Jesus and the Virgin (standing as orant). 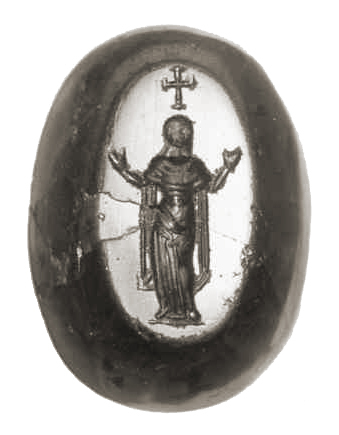 From the same workshop are garnets and sapphires of identical shape engraved with personal monograms (in Greek) of early Byzantine type, sometimes accompanied by a cross. London, British Museum. Garnet, 10 x 7.5 mm. The Virgin stands in prayer; a cross above. Private collection. Garnet, 17.0 x 12.4 mm. Monogram (the name "Matthew") and cross. Paris, Cabinet des Médailles. Sapphire.